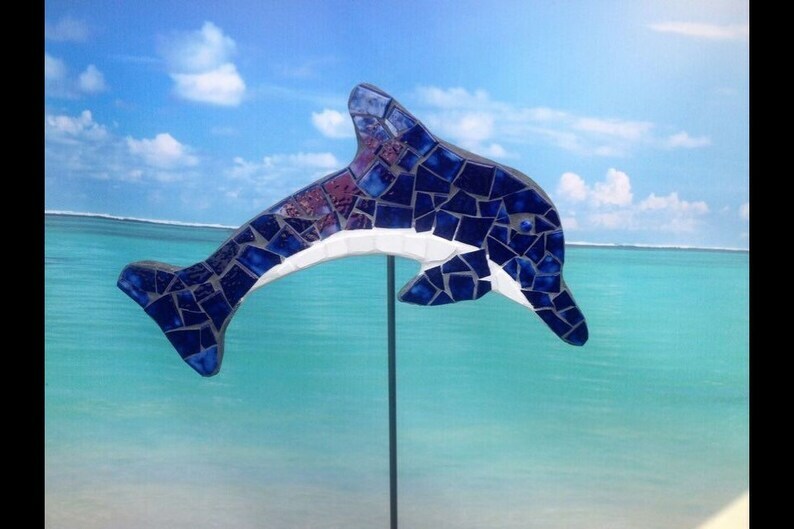 Tile mosaic dolphins to decorate the pool, yard or fence . Everyone is familiar with the dolphin inlays for a pool but most don't realize that having a mosaic in the pool only gets admired when your standing at the pool. The water then distorts them and they get covered up in the winter. You can never move them, add more mosaics to the scene or change them from time to time. 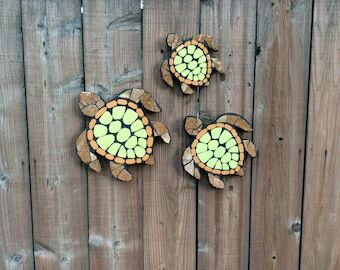 My mosaics change all of that!!! 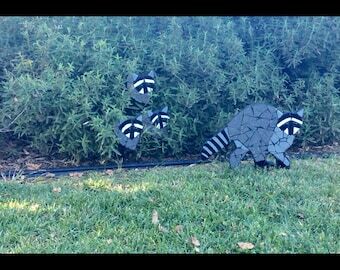 My mosaics can be easily moved, seen from the house, patio, side yard etc. You can add more mosaics, change the theme, decorate them for different holidays or just sit back and admire them. Mini Dolphins are 20" long, 5 lbs, come with a fence mounting bracket or a steel post sold separately. This dolphin is a pretty blue pool tile with strands of white to look like water. It also has a wave that catches the light. The dolphin sculptures are made of a water resistant dense foam, fiberglass and cement, tile and grout. Completely safe for year round outdoor display. Will not deteriorate or fade from mother natures elements. My personal suggestion is 1 red, white and blue dolphin and 2 solid blue mini Dolphins.